Holiday turkey dinner. Are there words that strike fear in the hearts of cooks more effectively than holiday turkey dinner? Probably not. Turkeys are just not made oven friendly. Add the 17 sides that everyone expects and you have a ridiculous task in front of you. Stop. Think. Why do you need 17 sides? What is the point exactly? Have you ever been to a great restaurant that put 17 sides on the plate? It makes no sense at all. None. Why not execute 5 things perfectly instead? Turkey, dressing, mashed potatoes, gravy and one vegetable. Who wouldn’t be happy with that? Quality over quantity. Pick your battles. Pick the ones you can win. This isn’t a recipe but the recipes are all here. It’s a guide to making a great holiday dinner. 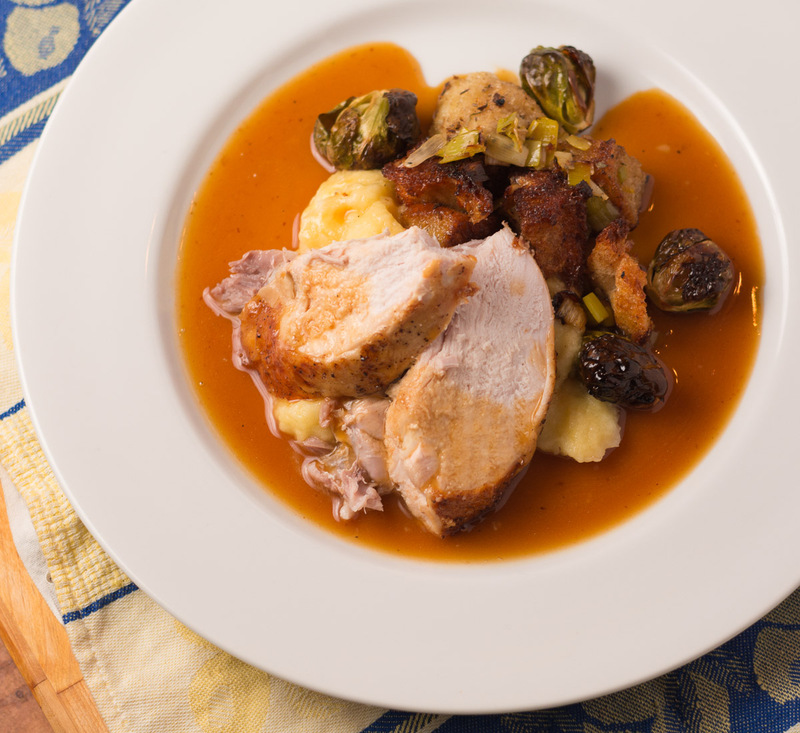 Moist turkey – dry brined. Dressing – lifted from the fabled Zuni Cafe chicken with bread salad. Gravy – think reduction for depth of flavour. Mashed and a vegetable I will leave to you although I’m a fan of roasted brussel sprouts. The turkey is the only really hard part. If you’re serving an army I can’t help you. If your dinner table seats 10 or less though, I can pretty much guarantee a moist, juicy bird. Dry brining and flipping your turkey are the keys to a perfect holiday turkey. Stuffing soaks up all the wonderful juices that will make your gravy memorable. Make a Zuni Cafe inspired dressing instead. Gravy is the thing that brings it all together. This gravy is worthy of a michelin starred restaurant.